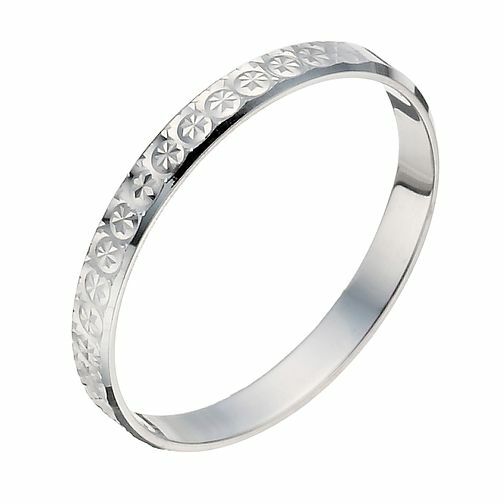 This slender 2mm wedding ring in 9ct white gold features a delicate diamond cut finish. Simple with a unique touch, this precious ring is perfect for forever. 9ct White Gold 2mm Diamond Cut Ring is rated 3.6 out of 5 by 23. Rated 1 out of 5 by Anonymous from Beautiful ring but don't bother! So I've been married just over 4 month's, and this ring has just snapped out of no where. It looks beautiful on, I picked it as it went nicely with my engagement ring. I will be returning, so disappointed!